What is a conversion? In the Christian world, especially among evangelicals, the term usually means “becoming Christian” – that is, converting from some other religion (or no religion) to Christianity. We may think of the apostle Paul’s conversion from Pharisaic Judaism to Christianity in the book of Acts (see chapter 9). But most Bible scholars will tell you that Paul never saw that as a change of religion. He probably just thought of it as the next step in his growth toward spiritual maturity – to accept what God was doing when he had formerly rejected it. In the Catholic Church, I’m considered a “convert,” meaning that I used to be Protestant and now I’m Catholic. But like Paul, I don’t think of that as a change of religion. At most it’s a change of denomination (like switching from Pepsi to Coke, if you’ll forgive the triviality of the analogy), but I’m the same religion I’ve always been: Christian. The interesting thing is that now I’m bi-lingual – I can speak Protestant and Catholic. And since one of my passions is ecumenical dialogue, I often get to act as a translator from one language to the other. And I’ve found that “conversion” is one of those words that is used in both languages, but with different meaning. In the evangelical Protestant tradition, “conversion” is usually understood as a point in time – an event. One makes a decision to be Christian, and from then on, that person is different. In the Catholic tradition (as well as others), “conversion” is more of a process. It begins with baptism, but continues throughout one’s life, and is never fully completed until the afterlife. When Jesus said that we all have to be “born again” (Gospel of John, chapter 3), he meant it in the sense of turning over a new leaf (in the other gospels, it’s called “repenting” – turning back to God). But Jesus knew that a one-time decision was not the end of the journey. Later in the gospel he tells his followers that they also have to remain in him (John 15:5-6). It’s not enough to start the journey, we have to stay on the journey. I’ve been listening to Bryan Flynn’s latest CD called Born Again. I think he gets it – conversion is not just a point in time, it’s a process – a journey we are all on. I encourage you to check out Bryan’s CD. I think you will find it encouraging for your journey. So is conversion a change in a person’s identity? Yes and no. On the deepest level, at your core, your identity is that you are a child of God made in the image of God. That will never change, and no one can take that away from you. (See my book Spiritual Blueprint for more on understanding your identity and what it means to be made in the image of God). If a person goes from non-Christian to Christian, then yes – that’s a change in identity – because this person was not a follower of Jesus Christ and now he/she is a follower of Jesus Christ. Baptism is a sacrament, in part because it produces a change in a person. After baptism, the person is on a new journey. Other than that, though, I think it’s all simply stepping stones on the journey toward union with God. And staying on the journey – remaining in Christ – has a lot to do with regular participation in the Eucharist. You know, it’s not only people who can go through a conversion. Things, and even places, can be converted – and even consecrated – for a new use. Things that were once profane can be re-purposed. Sometimes we even say a thing has been “baptized” to be put to use for Christian ministry. Historically, pagan temples were converted into churches – and this goes on today as old theaters, warehouses and spaces in strip malls are converted into places of worship. In my travels, the one place that stands out in my mind when I think of this phenomenon is one of my favorite places in Rome – and probably a favorite of most people who go to Rome. 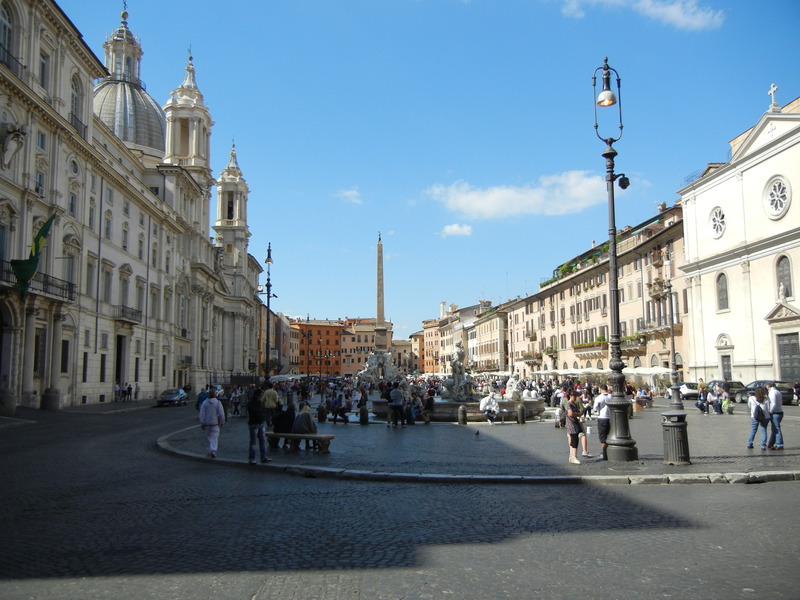 It’s called Piazza Navona. This is a favorite gathering place, with restaurants, artists selling their beautiful work, musicians playing, and at night it takes on almost a carnival atmosphere. But what most people don’t know is that it was once called the Circus of Domitian (you can still see that the foundation is rounded at the ends, the shape of an ancient Roman race track). In this circus, there were no clowns, but there were executions, and Christians died here during the persecutions. This is holy ground. If Paul, who persecuted the first Christians, could become the great evangelist for the faith… If Piazza Navona, a place where Christians died for their faith, can become a place of fun and joy… If God is the God of conversion – and he is – then there is nothing preventing you from continuing on your journey toward loving connection with the Divine and with other people. There is nothing in your past to prevent you from moving forward on that journey. As the Psalmist says, you are invited to “taste and see that the Lord is good” (Psalm 34). Want the folk song version of that psalm? Here’s my own version – a video of a live performance of my song, Taste and See. A recent studio recoding of the song is also on my new CD, Still Quiet Voice. By the way, I was at a songwriters’ meeting last night, and one of my friends, Will Kruger, has a new song, and he recently made a video. I think you should check out Is it Any Wonder by Will Kruger. I think you’ll find this song encouraging, too. Remember, it doesn’t matter where you’ve been, only that you’re moving in the right direction. If you’ve never made a decision to follow Jesus, the invitation is out there. If you have, Jesus is still – always – inviting you to remain in him. Taste and see that the Lord is good! well said! I heard years ago that our Catholic ‘altar call’ was everytime we stepped forward to receive the Eucharist. We have such a beautiful faith and I like thinking that there is so much more to learn and know going forward in my life, especially learning and growing in God. God bless you, Jim!